After the Destruction of the Temple. Beginnings of Modern Vernacular Sermons. That branch of rhetoric which treats of the composition and delivery of sermons or homilies. Although from the very nature of the case provision had been made for public worship among the people of Israel from the earliest times, this was confined to the sacrificial ritual and to the Levitical, priestly, and musical functions. Of preaching as a feature of the service there is no trace till after the Exile. True, the Deuteronomist commands that the Torah be read to the people at the end of seven years, on the Feast of Tabernacles, "when all Israel is come to appear before the Lord" (Deut. xxxi. 11-13); and the Rabbis refer the institution of the religious address to Moses (Sifra, Emor, xvii. ; Meg. 32a; Yalḳ., Ex. 408). Moreover, the belief was current that preaching was a very old institution, as is seen from the tradition ascribing activity in this direction to Noah (Sibyllines, i. 149; Sanh. 108a). Still it may be safely asserted that the preacher and the homily were late growths on the stem of Jewish religious development. In the Bible the nearest approach to the art of preaching is found in the activity of the Prophets. These were not officials in any sense of the word, however, nor were their addresses delivered only on stated religious occasions or in fixed places devoted to religious purposes. They spoke as the spirit moved them, anywhere and everywhere they felt that circumstances made it necessary to do so. Some of their addresses were undoubtedly delivered on Sabbaths and holy days (see Isa. i. 10-17, lviii. ), but not as part of the public services in the Temple; the "nabi" was more often in opposition to than in accord with the professional representatives of religion. Still, in spite of this, it remains true that the prophet was the forerunner of the preacher, and that the Prophets' addresses, though not an official religious institution, were the earliest sermons. 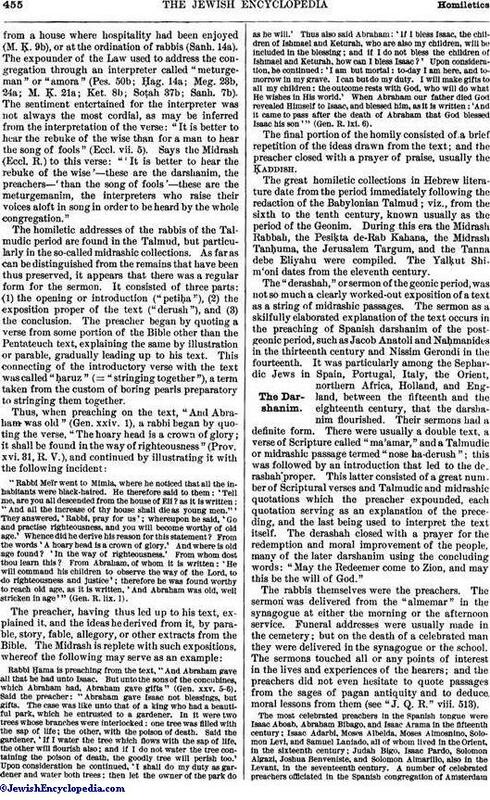 The real beginning of the exposition of Scripture as a homiletic exercise on the Sabbath, on holy days, and on other occasions when the people assembled for religious purposes is to be found in the custom, instituted by Ezra, of reading a portion of the Torah at the service and explaining or paraphrasing it in the vernacular (Neh. viii. 1-9, ix. 3). This translation or paraphrase was called Targum, and from it developed the practise of preaching in the synagogue—a custom that was in all likelihood in vogue as early as the fourth century B.C. (Zunz, "G. V." p. 330). Josephus ("Contra Ap." ii. 17) speaks of it as a very ancient custom (comp. Acts xv. 21); Philo mentions it as an important element of the public services ("De Septennario," vi. ; "Quod Omnis Probus Liber," xii. ); and in a fragment preserved in Eusebius ("Præparatio Evangelica," viii. 7, 12-13) the same author reports that the Jews of Rome assembled on Sabbaths in the synagogues, where they were instructed in the philosophy of their fathers ("Legatio ad Caium," xxiii.). In the New Testament "teaching in the synagogue" is mentioned so frequently that by that time preaching must have become very general among the Jews (comp. Matt. iv. 23; Mark i. 21, vi. 2; Luke iv. 15, vi. 6, xiii, 10; John vi. 59, xviii. 20; Acts xiii. 42, xv. 21). The two heads of the Sanhedrin in the first century B.C., Shemaiah and Abṭalion, are distinguished by the title "darshanim" (= "preachers" ; Pes. 70b). Doubtless the term "darshan" was originally applied to the expounder of the Law, and hence to the teacher of the Halakah; but the title lost this significance in the course of time, and became the designation of the preacher as such, who addressed the people in general, taught them the doctrines of religion and morality, comforted them in the grievous days that followed the destruction of the Temple, and expounded texts of Scripture not with a view to their halakic or legal interpretation, but to their haggadic or edifying possibilities. Hence also "darash" and "darshan" for the allegorization of Scripture (Ḥag. ii. 1; Soṭah 49a; Gen. R. v. 2; comp. "doreshe reshumot," Mek., Beshallaḥ, 1, 5, and elsewhere). K.After the Destruction of the Temple. After the discontinuance of the sacrifices consequent upon the destruction of the Temple, prayer and the religious address were the elements of the services; all the rabbis of note instructed and solaced the people who flocked to hear them. Rabbi Meïr's sermons on Friday evenings and Sabbath afternoons attracted large congregations (Lev. R. ix. 9; Yer. Soṭah i. 16d). The sermons were delivered either in the synagogue or in the school. Preaching took place not only in public, but also on private occasions, as at weddings and funerals (Ber. 6b; Shab. 153a; M. Ḳ. 25b; Meg. 6a; Ket. 8b; Ned. 61b), upon departurefrom a house where hospitality had been enjoyed (M. Ḳ. 9b), or at the ordination of rabbis (Sanh. 14a). The expounder of the Law used to address the congregation through an interpreter called "meturgeman" or "amora" (Pes. 50b; Ḥag. 14a; Meg. 23b, 24a; M. Ḳ. 21a; Ket. 8b); Soṭah 37b; Sanh. 7b). The sentiment entertained for the interpreter was not always the most cordial, as may be inferred from the interpretation of the verse: "It is better to hear the rebuke of the wise than for a man to hear the song of fools" (Eccl. vii. 5). Says the Midrash (Eccl. R.) to this verse: "'It is better to hear the rebuke of the wise'—these are the darshanim, the preachers—'than the song of fools'—these are the meturgemanim, the interpreters who raise their voices aloft in song in order to be heard by the whole congregation." 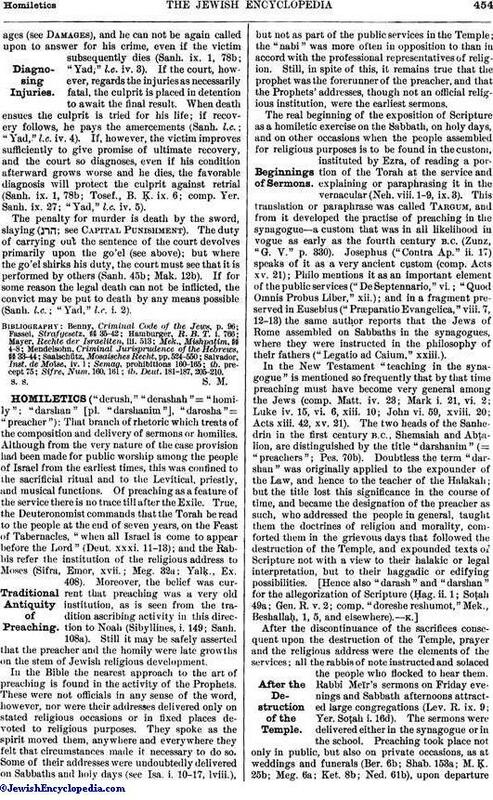 The homiletic addresses of the rabbis of the Talmudic period are found in the Talmud, but particularly in the so-called midrashic collections. As far as can be distinguished from the remains that have been thus preserved, it appears that there was a regular form for the sermon. It consisted of three parts: (1) the opening or introduction ("petiḥa"), (2) the exposition proper of the text ("derush"), and (3) the conclusion. The preacher began by quoting a verse from some portion of the Bible other than the Pentateuch text, explaining the same by illustration or parable, gradually leading up to his text. This connecting of the introductory verse with the text was called "ḥaruz" (= "stringing together"), a term taken from the custom of boring pearls preparatory to stringing them together. "Rabbi Meïr went to Mimla, where he noticed that all the inhabitants were black-haired. He therefore said to them: 'Tell me, are you all descended from the house of Eli? as it is written: "And all the increase of thy house shall die as young men."' They answered, 'Rabbi, pray for us'; whereupon he said, 'Go and practise righteousness, and you will become worthy of old age.' Whence did he derive his reason for this statement? From the words 'A hoary head is a crown of glory.' And where is old age found? 'In the way of righteousness.' From whom dost thou learn this? From Abraham, of whom it is written: 'He will command his children to observe the way of the Lord, to do righteousness and justice'; therefore he was found worthy to reach old age, as it is written, 'And Abraham was old, well stricken in age'"
Rabbi Ḥama is preaching from the text, "And Abraham gave all that he had unto Isaac. But unto the sons of the concubines, which Abraham had, Abraham gave gifts"
Said the preacher: "Abraham gave Isaac not blessings, but gifts. The case was like unto that of a king who had a beautiful park, which he entrusted to a gardener. In it were two trees whose branches were interlocked: one tree was filled with the sap of life; the other, with the poison of death. Said the gardener, 'If I water the tree which flows with the sap of life, the other will flourish also; and if I do not water the tree containing the poison of death, the goodly tree will perish too.' Upon consideration he continued, 'I shall do my duty as gardener and water both trees; then let the owner of the park do as he will.' Thus also said Abraham: 'If I bless Isaac, the children of Ishmael and Keturah, who are also my children, will be included in the blessing; and if I do not bless the children of Ishmael and Keturah, how can I bless Isaac?' Upon consideration, he continued: 'I am but mortal: to-day I am here, and tomorrow in my grave. I can but do my duty. I will make gifts to all my children: the outcome rests with God, who will do what He wishes in His world.' When Abraham our father died God revealed Himself to Isaac, and blessed him, as it is written: 'And it came to pass after the death of Abraham that God blessed Isaac his son'"
The great homiletic collections in Hebrew literature date from the period immediately following the redaction of the Babylonian Talmud; viz., from the sixth to the tenth century, known usually as the period of the Geonim. During this era the Midrash Rabbah, the Pesiḳta de-Rab Kahana, the Midrash Tanḥuma, the Jerusalem Targum, and the Tanna debe Eliyahu were compiled. The Yalḳut Shim'oni dates from the eleventh century. The "derashah," or sermon of the geonic period, was not so much a clearly worked-out exposition of a text as a string of midrashic passages. The sermon as a skilfully elaborated explanation of the text occurs in the preaching of Spanish darshanim of the post-geonic period, such as Jacob Anatoli and Naḥmanides in the thirteenth century and Nissim Gerondi in the fourteenth. It was particularly among the Sephardic Jews in Spain, Portugal, Italy, the Orient, northern Africa, Holland, and England, between the fifteenth and the eighteenth century, that the darshanim flourished. Their sermons had a definite form. There were usually a double text, a verse of Scripture called "ma'amar," and a Talmudic or midrashic passage termed "nose ha-derush"; this was followed by all introduction that led to the derashah proper. This latter consisted of a great number of Scriptural verses and Talmudic and midrashic quotations which the preacher expounded, each quotation serving as an explanation of the preceding, and the last being used to interpret the text itself. The derashah closed with a prayer for the redemption and moral improvement of the people, many of the later darshanim using the concluding words: "May the Redeemer come to Zion, and may this be the will of God." The rabbis themselves were the preachers. The sermon was delivered from the "almemar" in the synagogue at either the morning or the afternoon service. Funeral addresses were usually made in the cemetery; but on the death of a celebrated man they were delivered in the synagogue or the school. The sermons touched all or any points of interest in the lives and experiences of the hearers; and the preachers did not even hesitate to quote passages from the sages of pagan antiquity and to deduce moral lessons from them (see "J. Q. R." viii. 513). The most celebrated preachers in the Spanish tongue were Isaac Aboab, Abraham Bibago, and Isaac Arama in the fifteenth century; Isaac Adarbi, Moses Albelda, Moses Almosnino, Solomon Levi, and Samuel Laniado, all of whom lived in the Orient, in the sixteenth century; Judah Bigo, Isaac Pardo, Solomon Algazi, Joshua Benveniste, and Solomon Almarillo, also in the Levant, in the seventeenth century. A number of celebrated preachers officiated in the Spanish congregation of Amsterdamin the seventeenth century; viz., Isaac Uzziel, Abraham Lombroso, Manasseh ben Israel, Saul Levi Mortara, and Joshua da Silva. All of these rabbis preached in Spanish; but whenever they published their "derashot," they did so in Hebrew, because they felt that by this means they could reach Jews everywhere. Italy, too, had many Jewish preachers during this period; notably Judah Moscato, Samuel Judah Katzenellenbogen, Jacob Albo, Judah Leon di Modena, Azariah Figo, Jacob Zahalon, Judah Perez, and Isaac Cavallero. A number of Spanish-speaking Jewish preachers of note flourished also during the first half of the eighteenth century in various localities; among them may be mentioned Abraham Yiẓaḳi and Israel Algazi in Jerusalem, Elia Cohen in Smyrna, David Nieto in London, Isaac Abendana and Solomon Shalom in Amsterdam, and Abraham Isaac Castello in Leghorn. In Germany and France the title "darshan" can be traced back as far as the eleventh century (Zunz, "G. V." p. 416); but preaching was not so general in these countries during the medieval period as among the Sephardim; this was due to the fact that the prayer-book was overloaded with piyyuṭim which so lengthened the service that there was no time left for the derashah. In truth, the German and French Jews paid far more attention to the study of the Halakah than to the cultivation of the Haggadah, with the result that in time the delivery of sermons ceased almost altogether. The only approach to preaching took place on three occasions of the year. Two of these were the Sabbath ha-Gadol (immediately preceding the Passover Feast) and the Sabbath Teshubah (in the penitential season between the New-Year's Day and the Day of Atonement). On these two Sabbaths the rabbi explained to the congregation the laws to be observed in connection with the coming holy days. The third occasion was the eve of the Day of Atonement, when a discourse more haggadic in character, dwelling on sin and repentance, was delivered. The terrible persecutions experienced by the Jews in Germany and France, and the inferior social position which they occupied, combined so to depress the spirit that "thought was paralyzed, the ear was deafened to the word of comfort, and hope became a mute glance to the heights" (Zunz, l.c. p. 418). A further reason for the neglect of the sermon lay in the ever-increasing attention that was paid to the pilpulistic dialectics of the Talmud. The hair-splitting argumentation sharpened the wits, it is true; but it engrossed the interest of the rabbis and their pupils to the exclusion of all else. In lieu of discourses by regularly appointed preachers, occasional sermons were delivered in various communities by wandering preachers, who hailed for the most part from Poland and were called "maggidim" or "mokiḥim." Preaching became somewhat more general, however, among German-speaking Jews in the seventeenth and eighteenth centuries; a number of darshanim flourished in Germany and Poland during this time. Some of the larger congregations had regularly appointed darshanim; and in places where there were yeshibot, preachers were never lacking. The smaller communities, it is true, never heard a derashah unless perchance a wandering maggid happened their way. 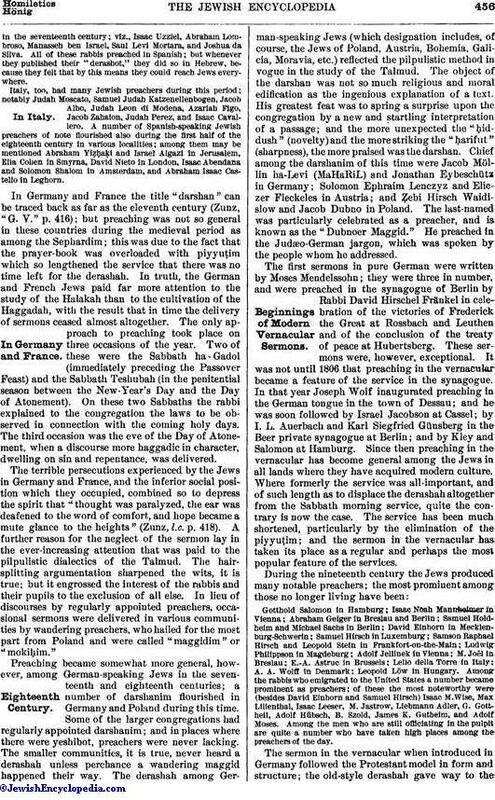 The derashah among German-speaking Jews (which designation includes, of course, the Jews of Poland, Austria, Bohemia, Galicia, Moravia, etc.) reflected the pilpulistic method in vogue in the study of the Talmud. The object of the darshan was not so much religious and moral edification as the ingenious explanation of a text. His greatest feat was to spring a surprise upon the congregation by a new and ṣtartling interpretation of a passage; and the more unexpected the "ḥid-dush" (novelty) and the more striking the "ḥarifut" (sharpness), the more praised was the darshan. Chief among the darshanim of this time were Jacob Möllin ha-Levi (MaHaRiL) and Jonathan Eybeschütz in Germany; Solomon Ephraim Lenczyz and Eliczer Fleckeles in Austria; and Ẓebi Hirsch Waidislow and Jacob Dubno in Poland. The last-named was particularly celebrated as a preacher, and is known as the "Dubnoer Maggid." He preached in the Judæo-German jargon, which was spoken by the people whom he addressed. The first sermons in pure German were written by Moses Mendelssohn; they were three in number, and were preached in the synagogue of Berlin by Rabbi David Hirschel Fränkel in celebration of the victories of Frederick the Great at Rossbach and Leuthen and of the conclusion of the treaty of peace at Hubertsberg. These sermons were, however, exceptional. It was not until 1806 that preaching in the vernacular became a feature of the service in the synagogue. In that year Joseph Wolf inaugurated preaching in the German tongue in the town of Dessau; and he was soon followed by Israel Jacobson at Cassel; by I. L. Auerbach and Karl Siegfried Günsberg in the Beer private synagogue at Berlin; and by Kley and Salomon at Hamburg. Since then preaching in the vernacular has become general among the Jews in all lands where they have acquired modern culture. Where formerly the service was all-important, and of such length as to displace the derashah altogether from the Sabbath morning service, quite the contrary is now the case. The service has been much shortened, particularly by the elimination of the piyyuṭim; and the sermon in the vernacular has taken its place as a regular and perhaps the most popular feature of the services. Gotthold Salomon in Hamburg; Isaac Noah Mannheimer in Vienna; Abraham Geiger in Breslau and Berlin; Samuel Holdheim and Michael Sachs in Berlin; David Einhorn in Mecklenburg-Schwerin; Samuel Hirsch in Luxemburg; Samson Raphael Hirsch and Leopold Stein in Frankfort-on-the-Main; Ludwig Philippson in Magdeburg; Adolf Jellinek in Vienna; M. Joël in Breslau; E.-A. Astruc in Brussels; Lelio della Torre in Italy; A. A. Wolff in Denmark; Leopold Löw in Hungary. Among the rabbis who emigrated to the United States a number became prominent as preachers; of these the most noteworthy were (besides David Einhorn and Samuel Hirsch) Isaac M. Wise, Max Lilienthal, Isaac Leeser, M. Jastrow, Liebmann Adler, G. Gottheil, Adolf Hübsch, B. Szold, James K. Gutheim, and Adolf Moses. Among the men who are still officiating in the pulpit are quite a number who have taken high places among the preachers of the day. The sermon in the vernacular when introduced in Germany followed the Protestant model in form and structure; the old-style derashah gave way to theInstruction in homiletics has been introduced into the Jewish theological seminaries both in Europe and in America. 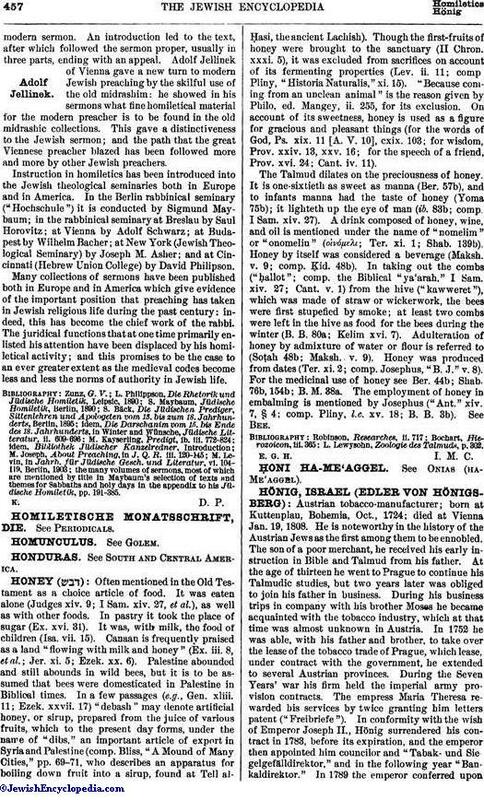 In the Berlin rabbinical seminary ("Hochschule") it is conducted by Sigmund Maybaum; in the rabbinical seminary at Breslau by Saul Horovitz; at Vienna by Adolf Schwarz; at Budapest by Wilhelm Bacher; at New York (Jewish Theological Seminary) by Joseph M. Asher; and at Cincinnati (Hebrew Union College) by David Philipson. Many collections of sermons have been published both in Europe and in America which give evidence of the important position that preaching has taken in Jewish religious life during the past century: indeed, this has become the chief work of the rabbi. The juridical functions that at one time primarily enlisted his attention have been displaced by his homiletical activity; and this promises to be the case to an ever greater extent as the medieval codes become less and less the norms of authority in Jewish life. the many volumes of sermons, most of which are mentioned by title in Maybaum's selection of texts and themes for Sabbaths and holy days in the appendix to his Jüdische Homiletik, pp. 191-385.